The first face that greeted me at the Rangoon airport was that of our tour leader, Kyaw Zaya, whom we called “Chaw.” As it turned out, Chaw was one of the best guides I have ever had on a tour. He was extremely knowledgable and eager for us to learn and experience as much as we could in our 14 days with him. And he took advantage of impromptu opportunities to share the “real deals” of life in Burma with us. He was also very caring and patient, spoke excellent English, even used American slang, and had a wonderful sense of humor. We laughed a lot along the way. The next face that we all recognized from all the US media coverage was that of Aung San Suu Kyi and Chaw filled us in on the history of Burma including the role of her father, Aung San, and her own efforts for a democratic Burma. 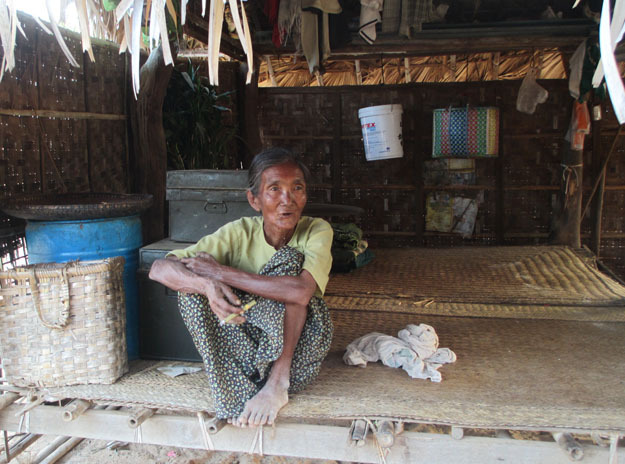 The people of Burma are both optimistic and realistic about their future and accept that change will come gradually. 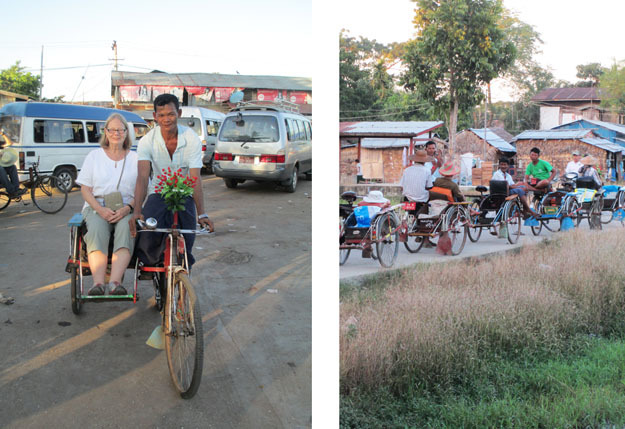 The people of Burma were very welcoming and we were greeted with lots of smiles. 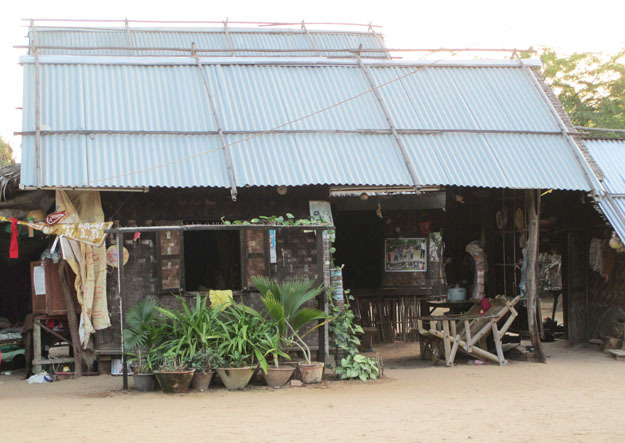 The people of Burma welcomed us into their homes, their shops, their cities, and villages. Their hospitality was sincere. I will remember them fondly. And here are my travel mates in front of the gates of Aung San Suu Kyi’s home where she lived under house arrest for 10 out of the last 18 years. 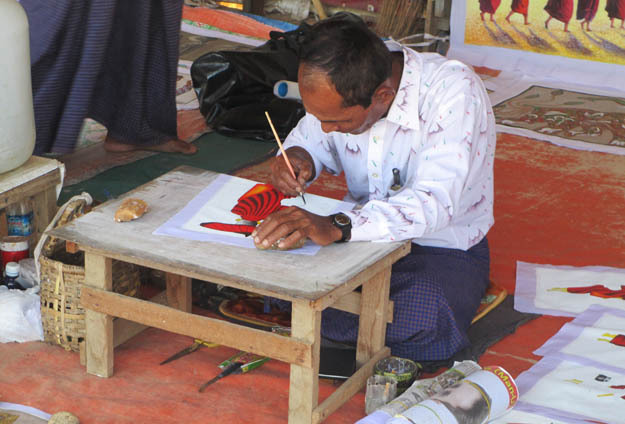 This entry was posted in Burma on December 23, 2015 by JWH. 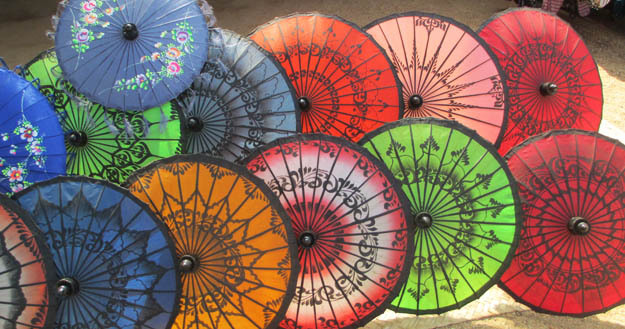 There are markets everywhere in Burma. I did not see one supermarket! 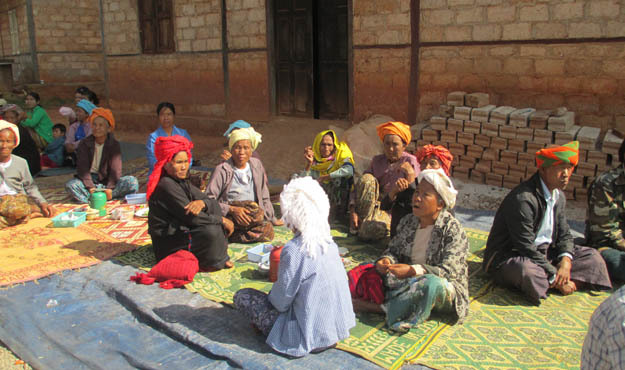 The Burmese markets vary in size but most offer produce and other foods in addition to house hold goods and clothing. We poked around a number of them. The entrance to a pagoda served as an entrance to a large market which reminded me of an outdoor flea market. Markets were often located on the grounds of pagodas and sold Buddhist things. Markets contained a lot of great looking fruits and vegetables, some unidentifiable to me. And in the markets and on the streets we encountered betel nut vendors. The nut is chopped up and wrapped in a betel leaf with a bit of lime and perhaps some spice and then chewed. It is a mild stimulant. It is also a carcinogenic like tobacco and is habit forming like smoking. The chewing of betel nut turns saliva red and eventually teeth black. Ugh! Chewers then spit red juice. Double ugh!! 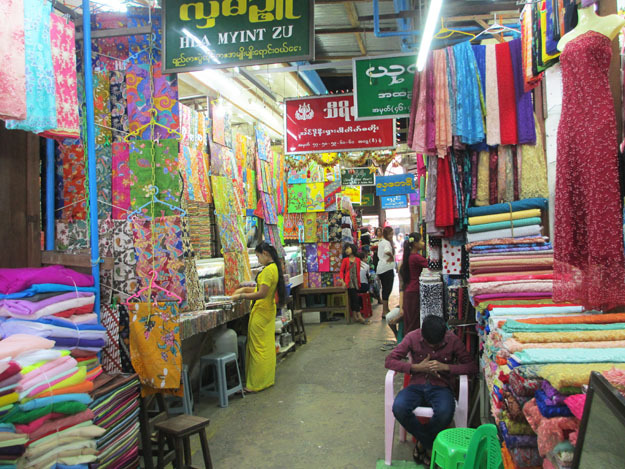 In Rangoon there is a famous covered market, Bogyoke Aung San Market, with over 2000 stalls which over the years has become very touristy selling souvenirs, antiques, “new” antiques, tee shirts and lots of jade and gemstones, especially rubies, and jewelry. 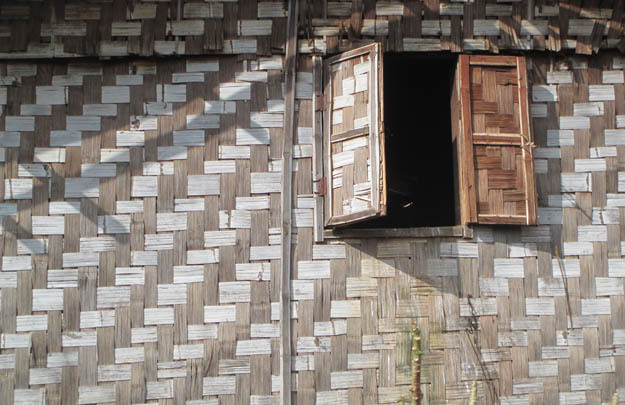 There was a lot to take in while traveling through the cities and county sides of Burma. One thing I noticed was how clean and free from litter the rural areas and villages were and how unlike India it was in that respect. Even in the cities, litter was at a minimum. 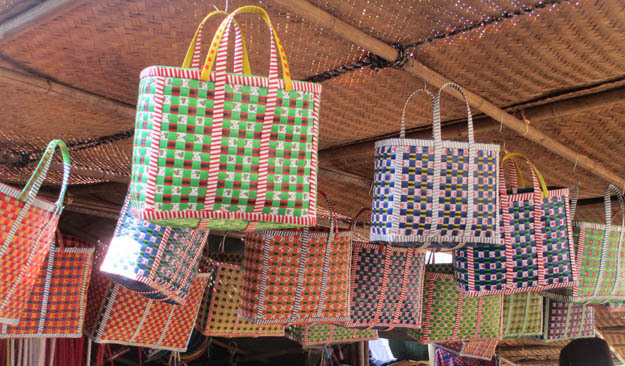 In the cities, vendors were on the streets and sidewalks everywhere selling produce, cooked food, paper supplies, clothing, betel nuts, and in the touristy places, of course, there were the souvenir vendors. This is a area in Rangoon where lawyers conduct business with their clients. Real estate deals are transacted under these umbrellas and because the purchase of property is carried out on a cash basis (no credit or mortgages) buyers bring sacks of money with them. The exchange rate for one US dollar is 1300 kyats. So to buy something that costs the equivalent of $40,000 means 52,000,000 in kyats. We saw men counting out huge stacks of money at these tables. The fellow behind the green device is squeezing juice from sugar cane. The fellow on the right is selling birds with the idea that if you release them, it brings you good luck. That is, if the birds can fly after being cooped up in cages for who knows how long! This woman is selling eels. The traffic is so congested with cars in Rangoon that motorcycles are prohibited. But elsewhere are motorcycles are plentiful. Helmets are not required, but I noticed that 50% of the riders wore them. This is Rangoon at mid-day when the traffic was light. Street traffic consists of cars, auto taxis, buses, motorcycles, bikes, trucks, vans, and pickup truck taxis like the one below. And although only a small fraction of the population is Christian, there were Christmas decorations and lights on buildings in the cities and in most every hotel we visited. We also heard Christmas songs being broadcast in hotel lobbies. Below are two of many trees we encountered – the left in the Mandalay airport and the other in our hotel in Rangoon. 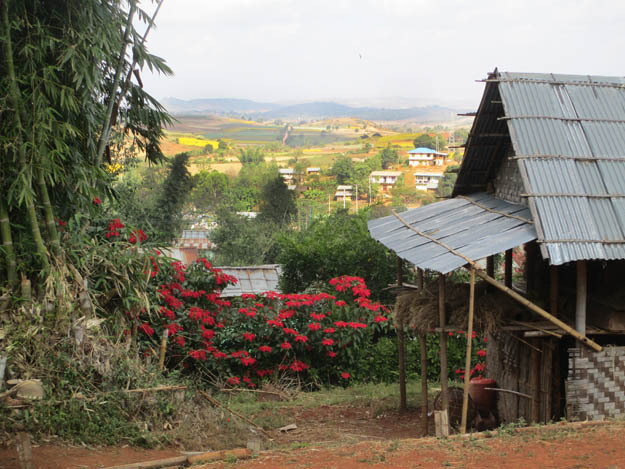 We drove through fertile countryside between Kalaw and Lake Inle where the soil was rich in iron. The area produces a wide variety of vegetables by farmers who live in nearby villages and who sell wholesale. Here our truck taxi’s bed and engine where exposed. Loud vehicle! Traditional dress, the longyi, is worn throughout Burma, however, I did observe more Western style dress in the big cities. 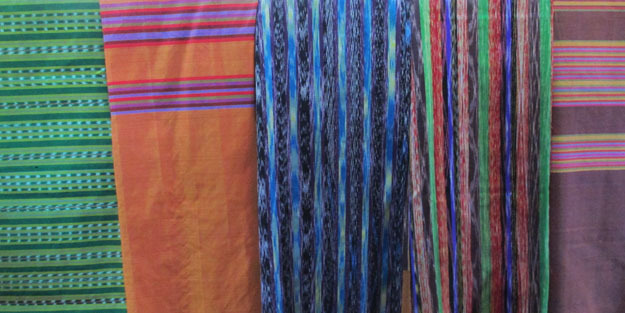 The longyi is piece of fabric with a seam that makes it into a wide tube. The fabric is folded over in the front and men attach it with a big knot in front while women tuck the fabric into their waistlines. To see a video of how men tie their longyi, click here. Throughout our travels in Burma we had many opportunities to discover and experience special activities and learn about customs. One for instance, is that Burmese woman and sometimes men apply a paste to their cheeks that serves as a sun block to keep their skin pale. 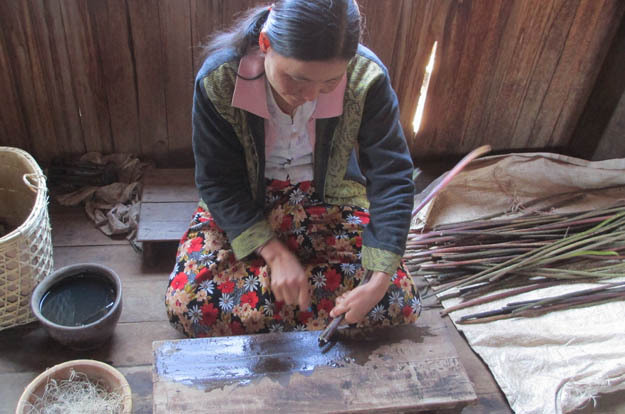 The paste is made from the wood of the Thanaka tree and is sold as a log, powder, or paste. In Bagan we visited a workshop to learn about how a popular soy-bean sauce is made in large batches cooked over wood fueled burners. Hot, steamy work. Here the women are packaging the paste for retail. 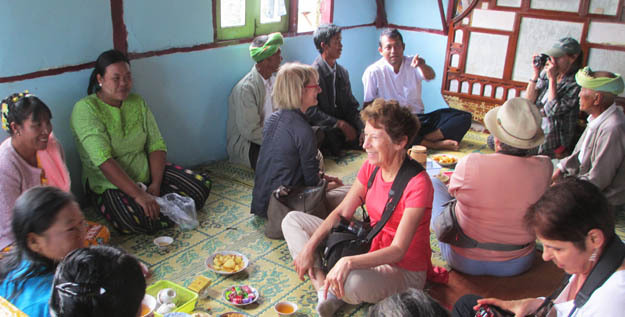 In Kalaw we stopped to observe how sap is collected from a palm tree and then made into sugar, sweet syrup, candy, and potent spirits – everyone enjoyed samples, especially the spirits! Burma has lots of gold mines. Even the soil is rich in gold dust. 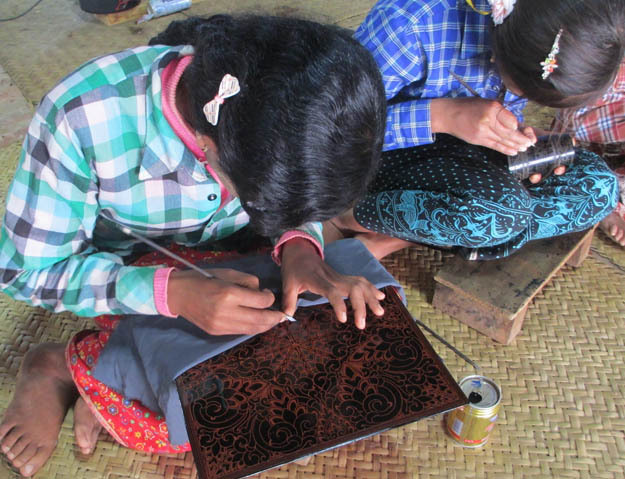 In Mandalay we watched how gold leaf was made by pounding with sledge hammers packets of papers with bits of gold in between so that after many hours of hammering, tissue thin leaves of gold were made. 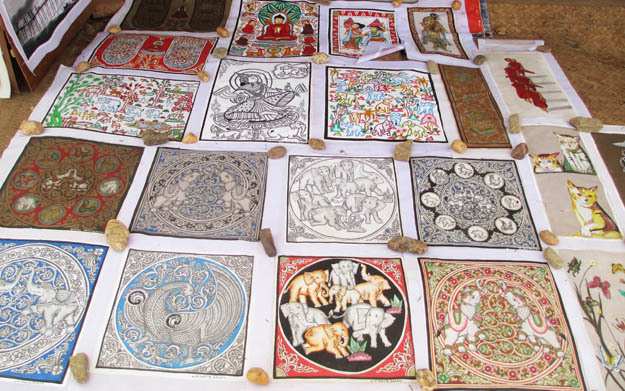 These are sold to Buddhist to apply to statues of Buddha. Eventually the details of the statues disappear under thick layers of gold as is the case with these bumps. The gold is also used in lacquerware. In Mandalay we visited the jade market and learned how buyers speculate on rocks. The fellow in the red shirt is using a flashlight to assess the rock from which a slice has revealed part of the interior. He is looking to see if the rock has potential for containing valuable jade. He offered the seller $10,000 but was turned down because the seller wanted $12,000. Sometimes a rock is sold without slicing it open and where only the surface is inspected in the hopes the rock has value. Many of the rocks are bought and then resold for a profit before they are processed. Most jade from Burma is sold to China where it is very popular, especially jade bracelets. In Kalaw we visited a school and spent some time with the children who are studying English along with their other studies. They sang for us and we played Simon Says with them. It was a new game for them and they were delighted with it. Barbara, a teacher in our group, gave the kids an English lesson and they caught on very quickly. 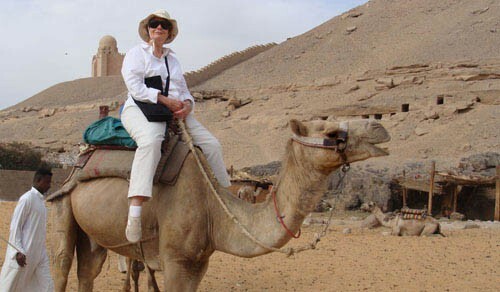 Our tour group company, Overseas Adventure Travel, supports various endeavors in the countries where they have tours. 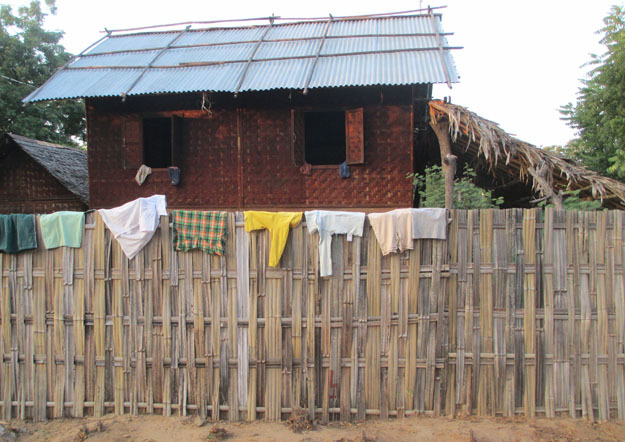 The school has benefitted from their foundation by providing a clean water system, new toilet facilities, and are now constructing small apartments for the teachers who have to travel long distances to get to the school. In the same village we visited a monastery and were introduced to the head monk who gave us instructions in meditation. 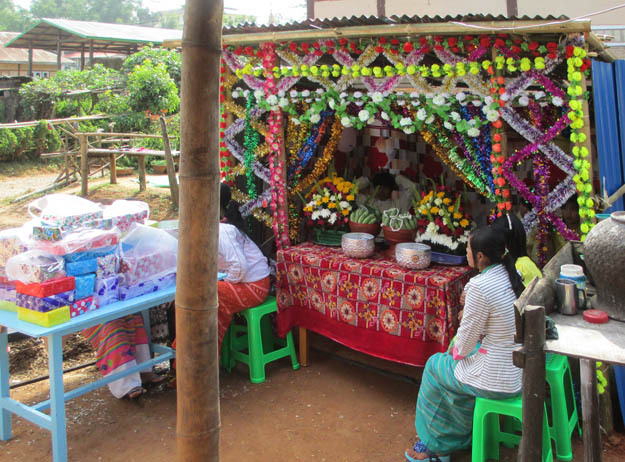 This entry was posted in Burma on December 22, 2015 by JWH. 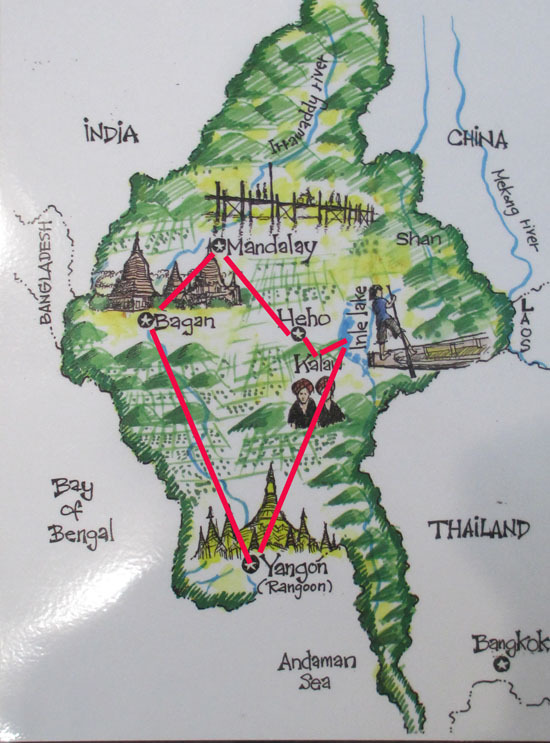 Here is a map of our trip which began in Rangoon (Yangon) followed by Bagan, Mandalay, Heho to Kalaw, and lastly, Lake Inle. The map was drawn by our guide and his 12 year old daughter. Lake Inle is a very unique place. Our first was our hotel/resort/spa! Throughout the trip we have been staying in 4 and 5 star hotels with lots of amenities and beautiful decors, but none compared with Pristine Lotus Spa Resort where we each had our own beautifully appointed and spacious bungalow in a dreamy landscaped setting! Here are a few pictures of this delightful place. Our hotel was located along a canal that took us by boat to the lake. We spent two days exploring Inle Lake (7 x 14 miles.) Transportation on this shallow lake is by long boat, either motorized or paddled, and the people (about 70,000) live in houses built on stilts and make their living by fishing, farming tomatoes on floating gardens and weaving. The fishermen paddle their boats with one leg while they drop and lift conical nets – an impressive skill! They also fish with netting. The lake is long and we traveled the upper parts of it by motorized long boat, 4 to a boat. Then we toured one of the villages by dugout canoe, 2 to a canoe, and paddled by local ladies. The ladies chatted with their neighbors as we meandered through the village. Some of the homes are quite large, others more modest, and there are hotels and restaurants, shops, and workshops also on stilts. There are extensive floating gardens on the lake where tomatoes are grown. 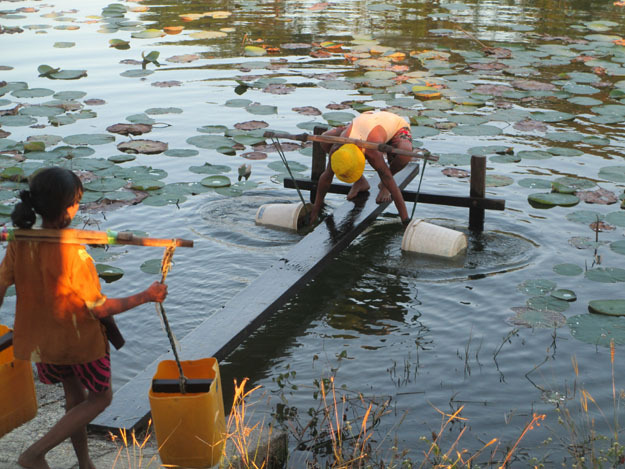 These gardens are made by rounding up water hyacinths and other aquatic plant material and securing the strips to the bottom of the lake with bamboo poles. Then seaweed and mud is put on top and the plants continue to grow forming a compact mass. Then seeds are planted. We experienced a bit of rain one morning, but otherwise, our weather was perfect during the whole trip. 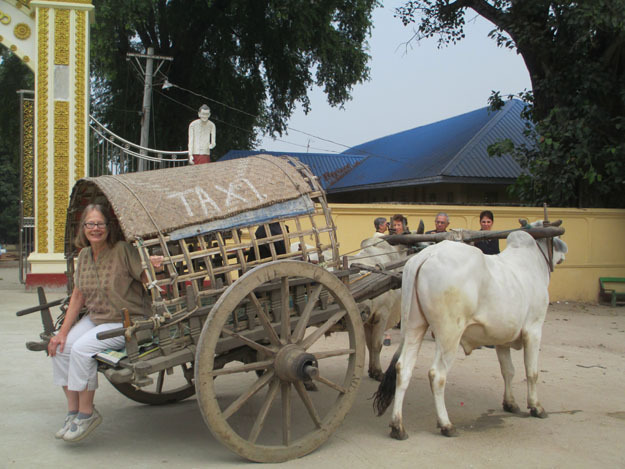 We visited several villages along the way, one by bicycle rickshaw, another by bull-drawn taxi, and the others by foot or boat. 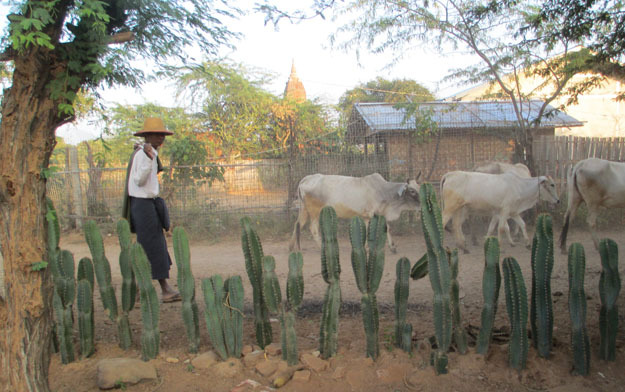 Access to clean water is often a challenge to these villagers, especially during the dry season. Often there is a central water supply in the village – a lake, cistern, or well, and residents must haul it daily to their homes. Below you see villagers using a lake where access is limited to 2 hours each day. We were told that if a lake had lily pads, then the water was drinkable. 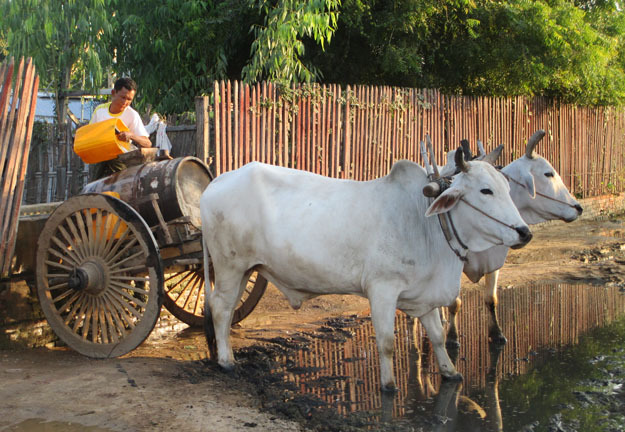 At this village, villagers load up water from a central well. 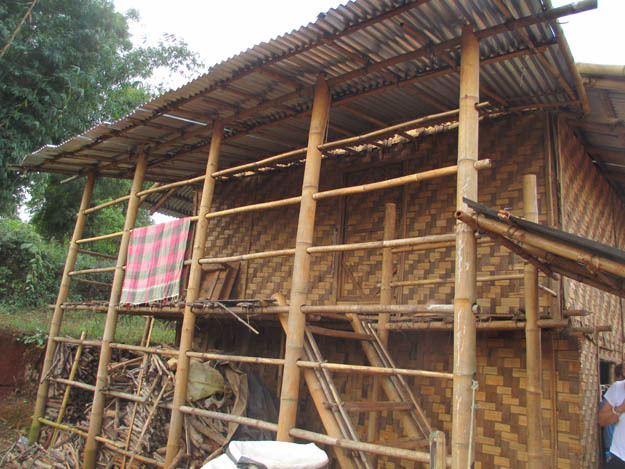 Traditional buildings – homes, barns, etc., are made of bamboo. They are built about 4 feet above ground to prevent snakes getting inside. 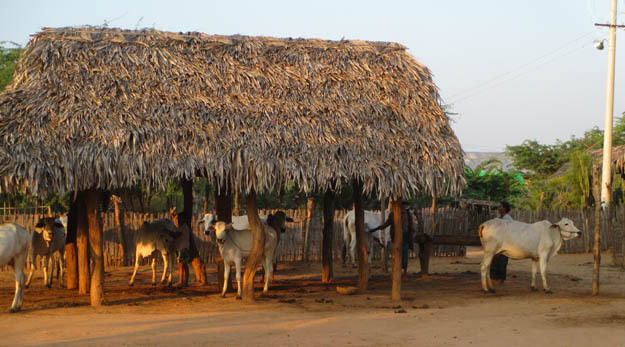 Metal roofs are beginning to replace thatch because it is better in keeping the rain out during monsoon season. The bright yellow fields in the distance are blooming sesame plants and poinsettias are in the foreground. 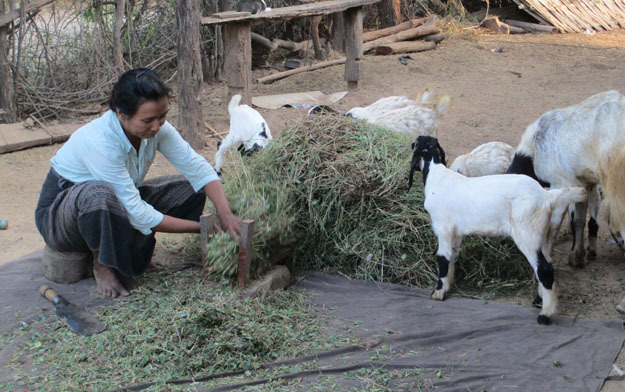 This woman is chopping food for the cattle, that is if the goats don’t eat it all first! Everywhere that we went, the villagers were very welcoming and didn’t mind at all if we photographed them. In fact, some seemed even eager for us to snap their picture. In one village we came upon a wedding. 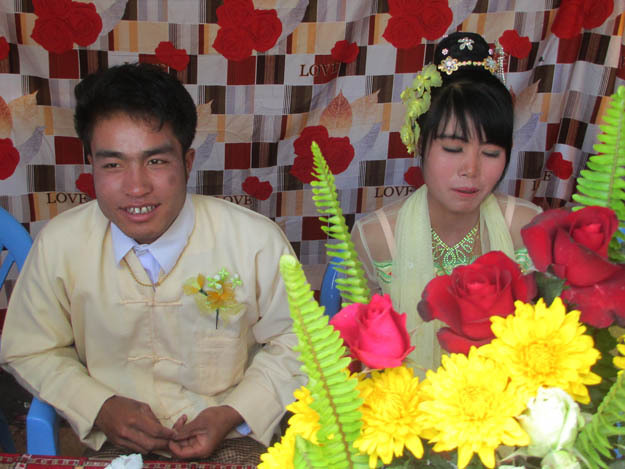 Marriages are finalized when parents announce to the village that their sons and daughters are married. There are no formal ceremonies. 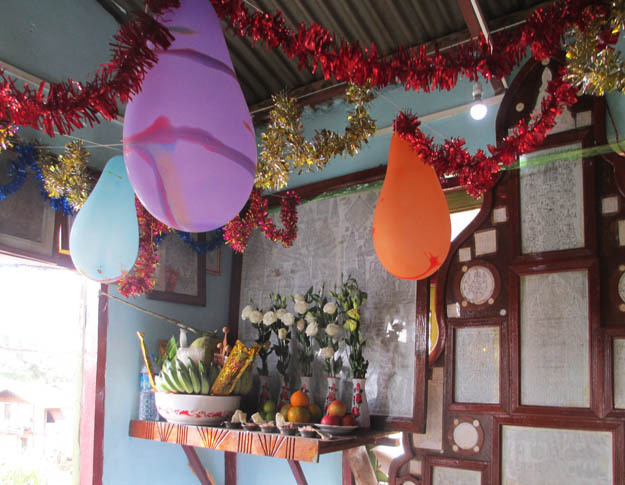 Then the families put on a day-long celebration and prepare a meal for the entire village. 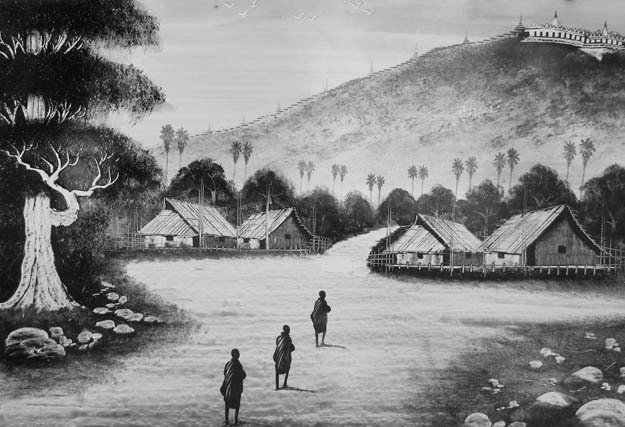 In this case, there were 800 residents in the village! The meal was served in shifts. The bride and groom greet visitors while sitting in a decorated booth. The custom is for each guest to tie string around the bride and grooms wrists to wish them good fortune as they are joined. We were immediately invited to join the celebration! Here are some of the other guests. Their clothing is typical of the Pa-O ethnic tribe. They are sitting in front of a house constructed of concrete blocks, which is a material that is gradually replacing bamboo. After tea, the parents invited us to share in the wedding feast. Four pigs had been slaughtered for the celebration. We felt very honored to have been treated so warmly by these villagers. 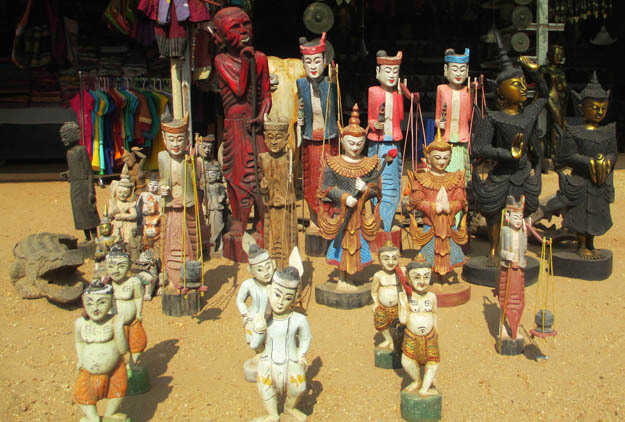 We referred to these authentic cultural experiences as the “real deal.” And we had many of them because our guide looked for opportunities to share with us the Burmese way of life. 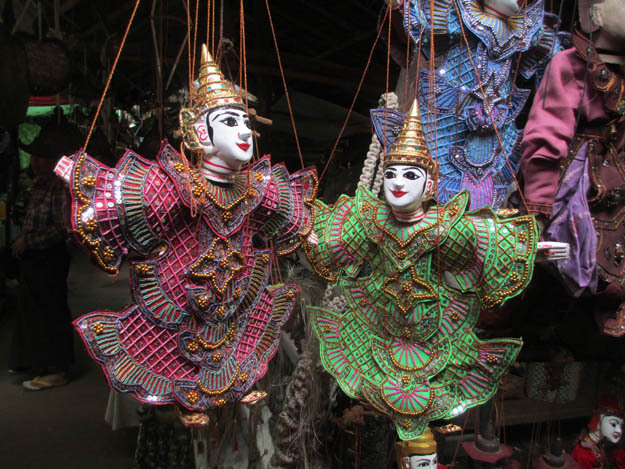 Here are some of the crafts that were for sale in shops and by street vendors. Bargaining was expected. 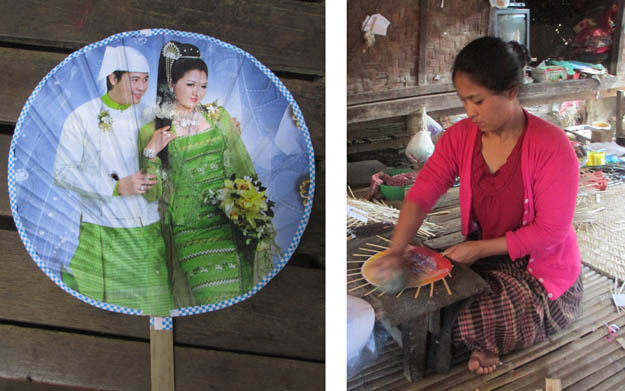 We visited a family that makes fans that are given out to guests on special occasions like weddings, anniversaries, and when young men become monks. We also visited the workshop of a lacquer industry. 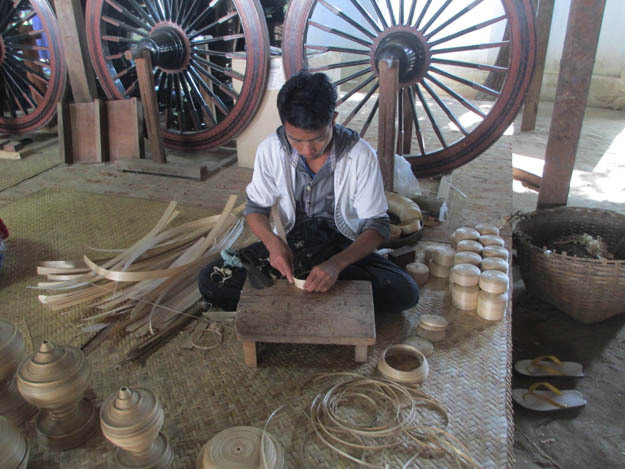 The forms are handmade of bamboo and numerous coats of lacquer are applied and decorated. 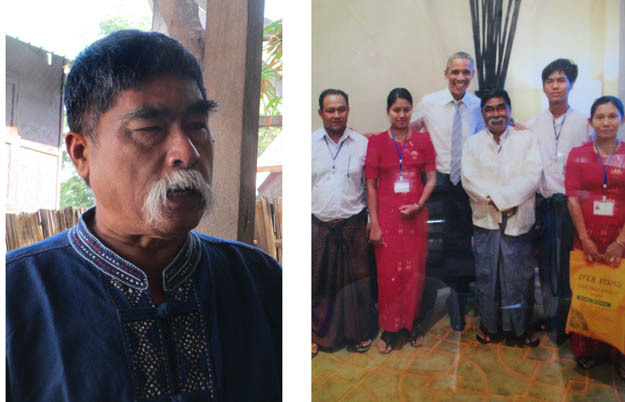 The gentleman who owned the shop was very proud that he was able to meet President Obama at a display of Burmese handcrafts arranged for the President’s visit to the country. 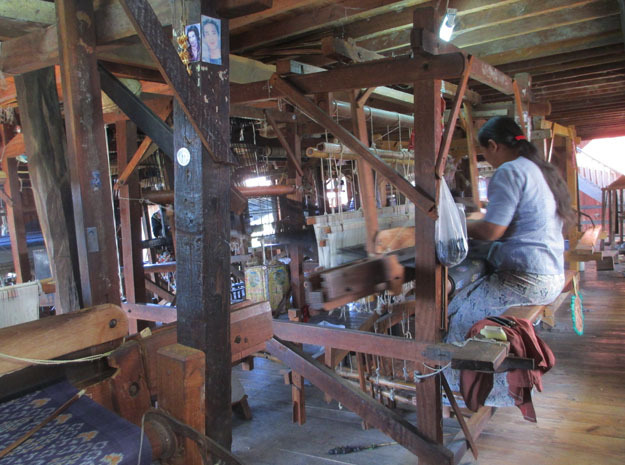 We also visited a weaving workshop where lotus, silk, and cotton fabrics where produced. 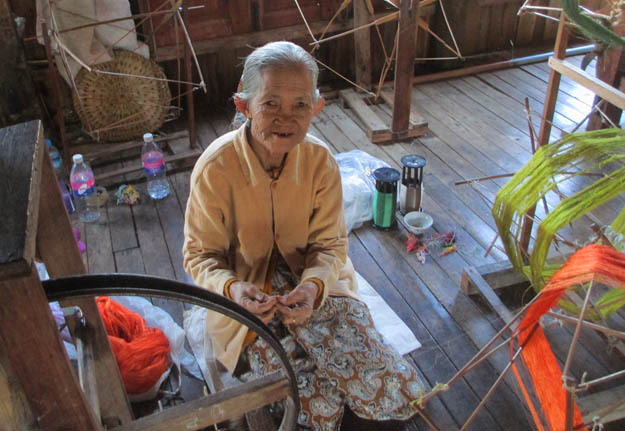 This women is spinning fibers from the stems of lotus plants – unique to this particular workshop. 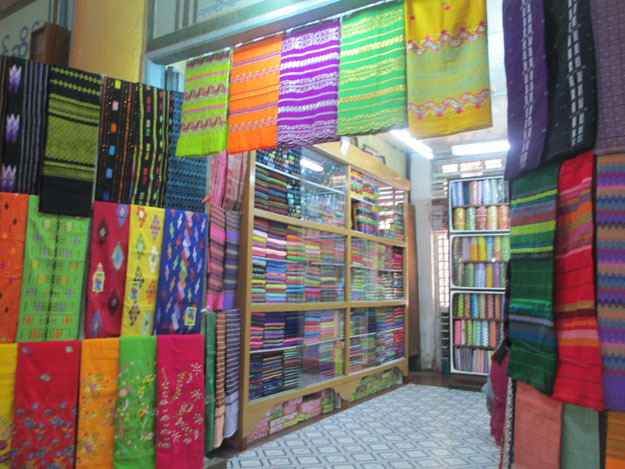 Throughout our travels we saw an abundance of gorgeous textiles.